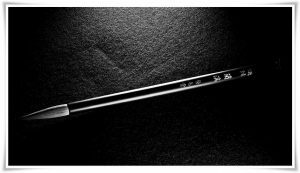 Continuing my somewhat metaphysical thoughts written in Part I of this article, in Part II, I would like to discuss the technical aspects of choosing a suitable calligraphy brush. As with everything in life, one’s first impression is crucial. 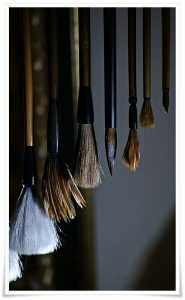 You will spend hours working together with a brush that you choose, so make sure you enjoy its aesthetic side. The one I bought (as shown in Figure 1) has long, well-arranged and carefully selected weasel hair (鼬毛, いたちけ, itachike), mounted on a wooden handle (筆管, ひっかん, hikkan, lit. 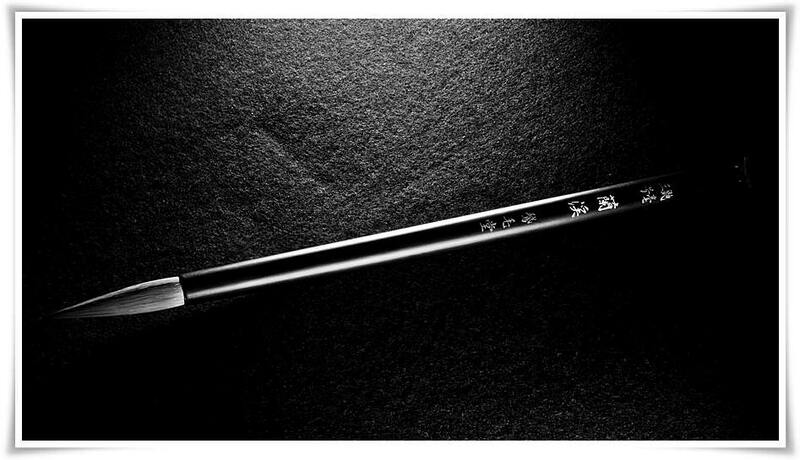 “brush tube / pipe”) which is painted matte black. On the upper part of the handle you can see skillful hand-made carving describing the type of hair used (鼬毛, いたちけ, itachike, i.e. “weasel hairs”), the size of the brush (三号, さんごう, san gō, i.e. “number three”, this is on a scale from one to ten), the brush name (蘭渓, らんけい, rankei, i.e. “valley of orchids”), and the name of the brand (鵞毛堂, がもうどう, Gamōdō`, i.e. “Goose Feather Temple” – a well-known calligraphy supplier in Greater Tokyo). (See Figure 1). There are a few characteristics that one needs to bear in mind while examining a brush. They are: 尖 (せん, sen, i.e. “pointed”), 斉 (せい, sei, i.e. “similar (uniform)”), 健 (けん, ken, i.e. “healthy”), and 円 (えん, en, i.e. “round”). 尖 in Japanese means “to be pointed”, or “sharp”, thus the brush tip must be sharp and pointed. There should be no irregularities in the symmetry or thickness of the tip of the tuft’s hair. This is especially important for brushes used for writing that requires precision (fine lines in sumi-e, standard script, small scale calligraphy, etc.). The pointed healthy tip of the brush is equipped with so called “hairs of life” (命毛, いのちげ, inochige). They are the beating heart of the brush, when they are worn down, the brush dies (See the “brush burial shrine” shown in Figure 3 in Part I of this article, here). 斉 in Japanese means “alike”, or “adjusted”. Basically, the brush tuft ought to be well arranged, i.e. the hairs should be symmetrical, not uneven, and should not be broken or have split ends. They must be of uniform shape and quality. (Figure 2). Figure 2. The tip of the brush. Note the characteristic spiral-like arrangement of the hair of the tuft. The brush needs to be healthy and full of vigour. Ken (健), in Japanese, means “health”. The virtue of “ken” suggests that the hair of a good quality brush (especially at the tuft base) should be flexible and responsive. No damaged hairs should be visible. Also, the brush axis should be straight and free of cracks. Bamboo shafts tend to crack, especially when they get extensively wet while washing the brush or when they are exposed to direct sunlight. Some venders offer mending of the brush or the changing of broken brush shafts. This is only something for consideration for the most expensive brushes. Finally, the 円 factor is critical. When you look at the brush from its pointing tip perspective, the tuft should be perfectly round, symmetrical and well balanced (Figure 2). Any irregularities will throw off the harmony of the line, especially when the brush is held at a 90 degree angle to the paper surface. The line should have the same quality no matter in which direction the brush turns. There are two main types of brushes, one with released hairs, so called さばき筆 (さばきふで, sabaki fude), and the other with glued hair in the form of a spike, so called 固め筆 (かためふで, katame fude). Usually the brushes made of harder hair are glued to avoid damaging them for storage and transport. Harder hairs break much more easily. For protection of the brush and transport until the brush is to be used, the tip is bound using animal bone extract based glue. It can be easily removed under running water. However, to ensure the best performance of the brush, the following method is suggested. Figure 3. Removing the glue from the brush after purchasing. Pour water into a clean and oil free dish. The water should not be warm, but can be tepid. The brush should be dipped to 3/4ths of the length of the brush tuft, so that the loins (腰, こし, koshi i.e.) 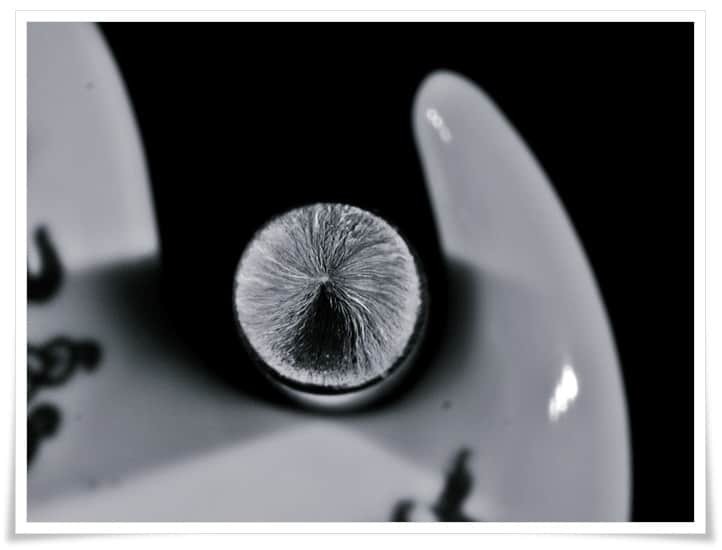 are not submerged (Figure 3). My teacher often advises beginners not to remove the glue from the loins as it hardens the tuft base. The brush, depending upon the size and hair thickness, should be left suspended in the water soaking off the glue for 1 to 24 hours. The remains of glue may mix with the ink and reduce the quality of writing, so this stage is essential. Afterwards, the brush should be rinsed under running cold water. Occasionally, you can gently squeeze the tuft at the loins, between your index finger and thumb in order to remove the remains of the glue from the “stomach” (腹, はら, hara). After a few hours of soaking, the water in the dish will be saturated with glue residue. 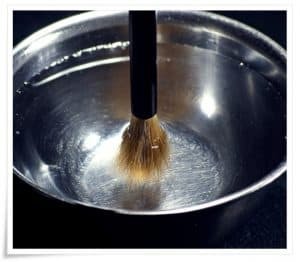 Remove the brush from the water, gently form it into a point from the base of the tuft hairs to its end and hang the brush on a hanger to allow the excess water to drip down, thus, leaving the brush to dry naturally (Figure 4). Figure 4. Brushes of various sizes suspended on a brush hanger. The brush is now ready for use. Each time I prepare a brush for writing, I soak the tuft in water and remove its excess by squeezing the loins. During extended writing, that prevents the ink from drying out. In any case, one should write with the tip of the brush (1/3rd the length of the tuft) for best performance. If you are forced to use the whole tuft length, it usually means that you should use a longer haired brush. Nonetheless, the emotions calligraphy invokes can carry us away in high spirits, having us use the whole tuft of the brush for writing certain strokes. This is a fine example of everything being in synchronicity, the brush an extension of the hand and arm and body and spirit. Again, soaking the entire tuft in water prior to studying should assist you in writing. This is, however, my personal preference. The last thing that is very important is that a brush, as every living entity, needs a proper rest. You should not use the same brush every day, you will damage it. 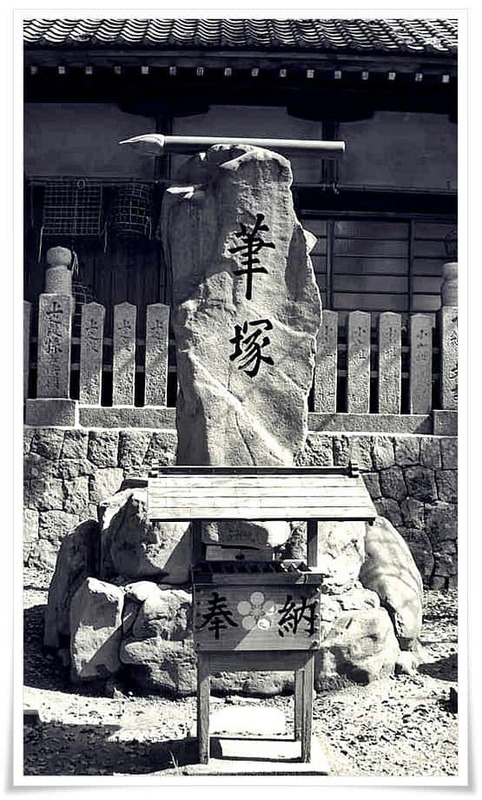 Also, it is good to switch brushes during writing in order to learn more about the relationship between the Four Treasures of the Study (文房四宝, ぶんぼう しほう, bunbō shihō). Such knowledge is invaluable in improving your 書 (しょ, sho, here: “calligraphy”). Parsing the above comment, using a dictionary to help decipher it but also printing out the instructions in English of how to prepare a new brush for use today, I am again dumbstruck by this amazing new resource, far Beyond Calligraphy. Whatever I may be contributing, I am learning far more than I ever imagined possible. Thank you Rona. Both your comments and assistance are greatly appreciated!